Apart from its well recognised digestive (mechanical and enzymatic) and absorptive functions, the gut also produces peptides that have autocrine and paracrine as well as endocrine functions. 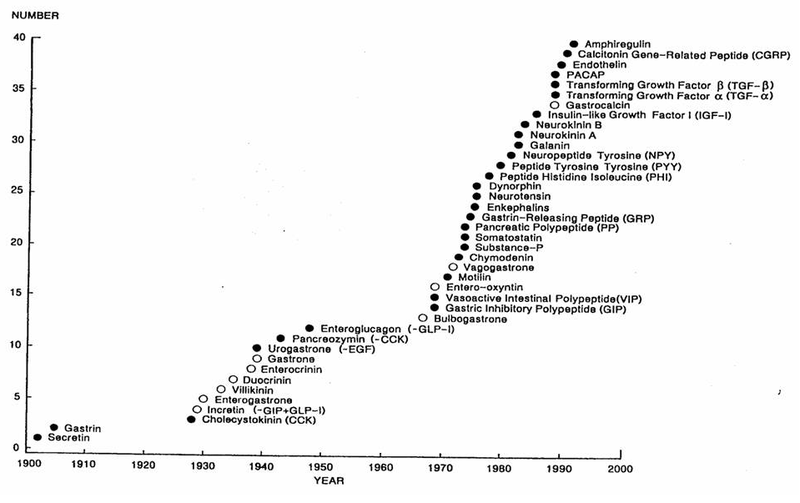 Following on from the description of the first gut hormone in 1902 (secretin), multiple gut-derived hormones have been identified (See Chronology below) elevating the status of the gut from a purely alimentary organ to that of the largest endocrine organ in the body, with the adipose tissue being a close second. These gut-derived peptides can facilitate gut growth and development with maintenance of mucosal integrity (e.g. GLP-2), facilitate gut secretions (e.g. Secretin, Cholecystokinin), modulate gut motility (closed-type cells in the gut wall detecting stretch) and signal to the brain regarding presence and absorptive status of nutrients (e.g. Peptide YY, GLP-1); the latter function depending on their location in open-type cells communicating with the gut lumen. They would thus mediate not only the sensory aspects (afferent loop) involving satiety, but also set up an efferent loop bringing about gastrointestinal changes to nutrient ingestion in the form of altered bowel secretions and motility. Thus, a Gut-Brain axis exists which ensures effective regulation of nutrient intake through control of appetite, satiety and absorptive and digestive ability.